The Yankees will have to wait at least one more day to play their first game at Yankee Stadium this season. Today’s home opener has been snowed out. The Yankees haven’t made an announcement yet, but it’s coming. The makeup game is scheduled for 4pm ET tomorrow. The weather forecast doesn’t look great for tomorrow, so it’s possible the Yankees and Rays are looking at back-to-back postponements. Hopefully it doesn’t come to that. If it does, the Rays still have two more series at Yankee Stadium this year, so there’s still plenty of time to schedule a doubleheader. If tomorrow’s makeup game is played as scheduled, the Yankees will play six games in the next six days, meaning Jordan Montgomery will have to make his second regular season start on normal rest. Not a huge deal, but the schedule had neatly lined up in such a way that all five starters would make their second and third starts on extra rest. Alas. 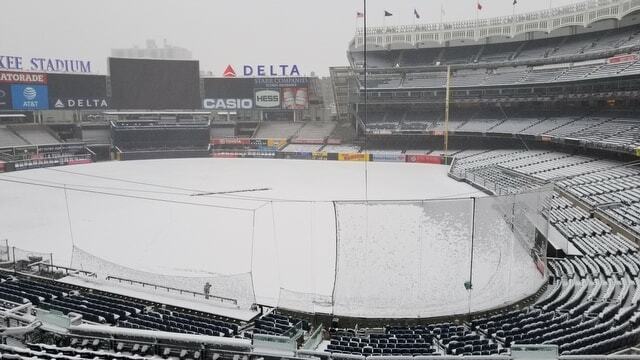 This is the second time in three years the Yankee Stadium home opener has been postponed. Opening Day 2016 was rained out and played the next day. The Yankees had some pretty good weather luck last year and in Spring Training. So of course he first regular season home game was postponed. Go figure. Update: Montgomery will start tomorrow. The Yankees will stay on turn rather than go with Luis Severino on normal rest. Makes sense. Also, the Rays will start Chris Archer rather than their fifth starter, some guy named Bull Penday.